Asante Twi is the most important Ghanaian language to learn if you have to choose only one of the over 80 local languages spoken in Ghana. Asante Twi is spoken by more than 10 million Ghanaians. As you know, the best way to pick up a language is to speak it with people who already speak it, but if getting people to help you speak it frequently becomes a problem there are two unconventional techniques that will greatly help. 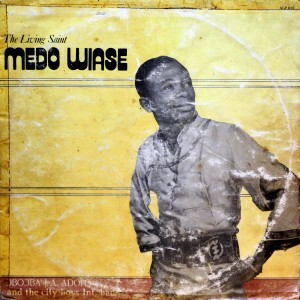 Listening to music sung in Asante Twi can help you to hear how the words and sentences are said. 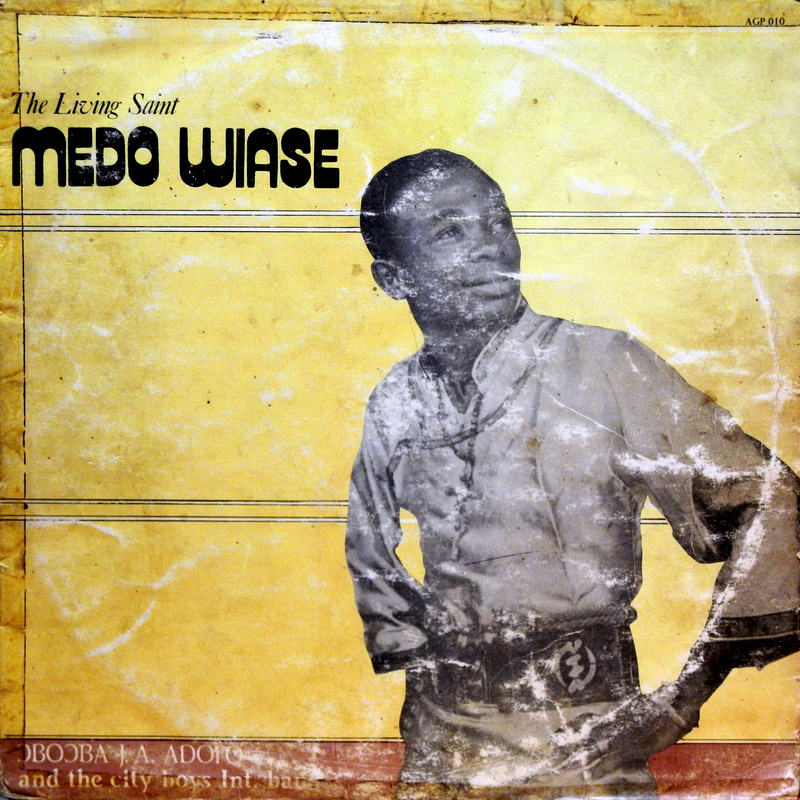 More music is made in Asante Twi than any other language in Ghana. There are tons and tons of Twi Gospel, Highlife and Hiplife songs you can listen to on Ghanaian radio stations. If you are using an iOS device like an iPhone or an iPad you can download the TuneIn app and get a list of Ghanaian radio stations that play Highlife music from Daddy Lumba to Kwabena Kwabena and even oldies from Ɔboɔba J.A. Adofo. I recommend listening to radio stations like Peace FM and Adom FM. You can also purchase songs from excellent Twi speaking musicians like Sarkodie, Obrafour, Bisa Kdei, and K.K Fosu on iTunes and listen and deciper their melodic lyrics. Just as it is with music, more movies are made in Ghana in Asante Twi than any other language. They are mostly of the comedy genre and referred to as Kumawood movies because they are almost all the time produced in Kumasi. Kumawood movies are poorly produced but watching them to help you learn Twi is a bit better than listening to Twi music because when you don’t understand what is being said you can always read the body language of the actors to help you know what is happening. A few of the movies also have subtitles that can help you understand the scenes even better. A word of caution with the subtitles is that they contain a lot of English grammatical errors. You can search for Asante Twi movies on Youtube. I recommend movies starring actors like Kwadwo Nkansah, Dabo or Agya Koo. Posted on December 24, 2015 by Nkyea. EXPLANATION: “Adeɛ foforɔ yɛgyina dada a obi ayɛ so” – A new thing is designed on an old one. Twi Phrasebook version 4.0.1 is ready for download. Searching in Twi was one of the most requested features last year so I’ve added it in this update. You can now search for a word or phrase in English or Twi in version 4.0.1. To search, simply tap the search bar, choose English and search in English or Twi and search in Twi. To type Ɛ and Ɔ, when searching in Twi, you could download and install Nkyea Keyboard or use the keyboard shortcuts technique shown here. Nkyea Twi Phrasebook provides translations of more than 3600 practical and useful phrases. It replaces bulky and inconvenient books and speaks all of its phrases aloud using clear, understandable native Twi speaker voice narration. With it you will be understood – even if you can’t speak a word of Twi. Download Twi Phrasebook now and if you like it, support it by rating it in the App Store and telling your friends to get it too. If you already have a previous version then update now. Posted on February 11, 2015 by Nkyea. With the exception of a few people, most of the Twi speaking iPhone and iPad users I interact with on the Internet use the characters 3 and ) in place of Ɛ and Ɔ when typing. They use these because the standard iOS keyboard doesn’t come with Ɛ and Ɔ. You have two choices if you want to type Ɛ and Ɔ. You can save the two characters as keyboard shortcuts if your device runs iOS 7 or lower or you can download and install Nkyea Keyboard from the App Store if your device runs iOS 8 or higher. I came across the keyboard shortcuts technique on @ObengWoHa‘s Akan language Tumblr blog a while back before iOS 8 was released. Below is how to add the characters as shortcuts on your keyboard. Open the Notes app on your iPhone or iPad and copy and paste ɛ and ɔ from this blog into a note. Open the Settings app, tap General, tap Keyboard and tap Shortcuts to open the Shortcuts screen. Tap the + button on the top bar. Copy ɛ from the Notes app, paste it into Phrase, type eee into Shortcut and tap Save. Copy ɔ from the Notes app, paste it into Phrase and type ooo into Shortcut and tap Save. Now any time you want to type ɛ or ɔ in any app, all you do is type eee or ooo and Space respectively. That’s it! Personally I think the keyboard shortcuts technique is a bit cumbersome so I made Nkyea Keyboard when Apple released iOS 8. As you may know iOS 8 supports third-party keyboards. 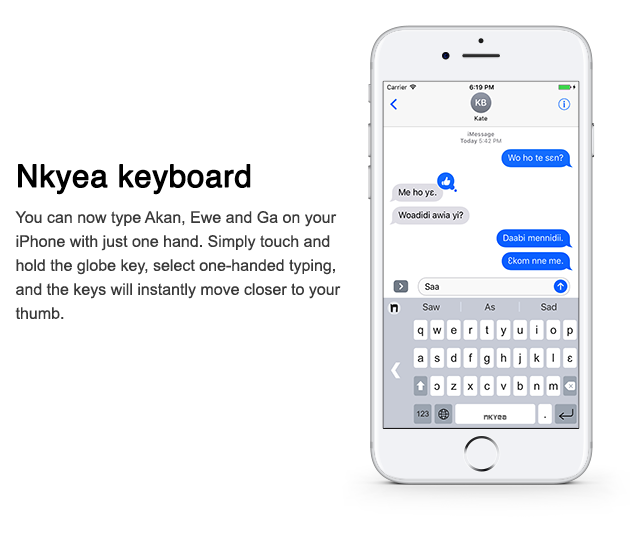 You should download and install Nkyea Keyboard as one of your keyboards if you are running iOS 8 or higher. Below is how to install Nkyea Keyboard after you’ve downloaded it. 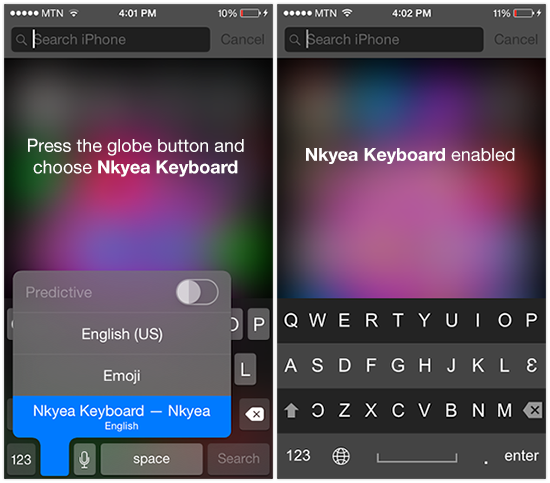 Final tap Nkyea Keyboard – Nkyea and tap Allow Full Access and choose Allow from the alert. Now to use Nkyea Keyboard press the globe button on the standard iOS keyboard and choose Nkyea Keyboard – Nkyea. NOTE: You can only choose different keyboard colours and hear key taps when Allow Full Access is enabled. 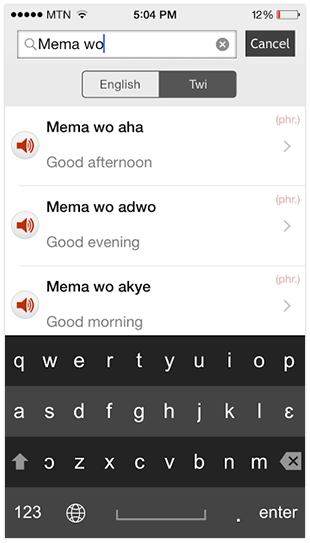 Apart from making it easy to type Ɛ and Ɔ, Nkyea Keyboard also includes a nifty built-in English-to-Twi word translator. You can use the translator when you get stuck typing a Twi word. Below is how to use the translator. Swipe down on the keyboard to reveal the translator. Type the word you want to translate, in English, and tap trans and it’ll be translated into Twi. Now tap add at the bottom of the keyboard to add the translation into what you are typing. Swipe up on the keyboard to hide the translator and continue typing. 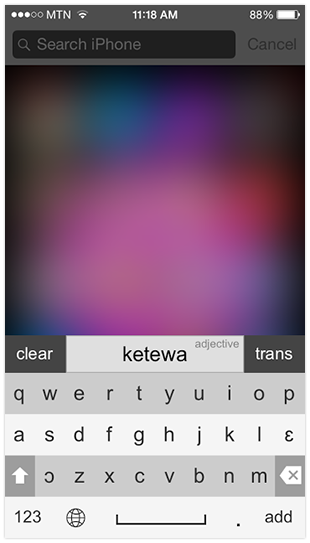 So you can use the shortcuts technique to add Ɛ and Ɔ into your typing if you use iOS 7 or lower or you can download and install Nkyea Keyboard, get all the keys necessary for typing Twi and the added benefit of using a powerful built-in English-to-Twi translator if you use iOS 8 or higher.